You may have come across the word pulse in a recipe or in an instructions guidebook for a blender or food processor. While it’s a completely legitimate word, many don’t actually know what the meaning of a pulse button is. In all honesty, I had never heard of this word either before I became a green smoothie fan several years ago. The pulses that you can eat are the edible, dried seeds of plants in the legume family, such as peas, lentils, edible beans and chickpeas. But that’s not the type of pulse I am referring to in this article. We are going to have a closer look at the pulse function on blenders and food processors. It turns out, pulsing is actually quite a handy feature to have! The pulse setting is becoming more common on modern blenders. In fact, most high end blenders will almost always have this setting by default. But a lot of more affordable blenders nowadays also offer this feature. Pulsing with a blender means you can quickly process ingredients before you start the blending process. For example, if you have chunky vegetables, it’s a good idea to use the pulse setting to quickly chop them in smaller pieces. With soups, you can use the pulse setting when you want to add little chunks of vegetables, instead of liquefying them. When using the pulse button, the blender works at medium speed and stops immediately when you release the button. This allows you to create a finer texture that is easier to blend with the rest of the ingredients in your smoothie. You can also use this function to grind up herbs. Or to quickly pulverize nuts into a fine texture without actually blending them into a creamy substance. Another good example of when this setting is crucial is when you want to make salsa. A good salsa typically has little chunky pieces of onion, tomato and other ingredients. The pulse function allows you to create these little chunks with ease. 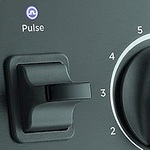 On some blenders, the pulse setting is indicated with just the letter “P”, or with a weird cryptic symbol. If these blenders come with proper instructions that explain what this button does, you’re in luck. Otherwise, you may just never know what this function is for and always ignore it! Is Pulsing a Useful Feature? Yes, pulsing is a great feature to have! On a blender though, the effects of pulsing can easily be achieved with the variable speed button in combination with the on/off button. Simply set the variable speed setting to where you want it to be, and flick the blender on and off multiple times. Having said that, a pulse button takes the guesswork out of all this and makes pulsing easy to do. It gives you full control over the process and it works wonders with chunky ingredients. In addition, a pulse function isn’t a costly investment for a kitchen equipment manufacturer to add to a blender. In other words, this doesn’t drive up the purchase cost of a blender all that much. In short, if you often blend certain ingredients that require a bit of chopping and cutting before blending, a pulse button will come in very handy.